Outstanding amongst the many new products introduced by the 2008 is the new Fun version, the ideal answer for young, go-getting customers who are looking for a sporty, safe, accessible car with lots of creature comforts and equipped with scintillating engines that are respectful of the environment. Available with five power units- 65 bhp 1.2 , 77 bhp 1.4 , 120 bhp 1.4 Turbo T-Jet in addition to two 1.3 Multijet units offering 75 bhp and 90 bhp – the Grande Punto MY 2008 Fun offers painted door mirrors, a 16", spoiler, burnished headlights, fog lights and leather steering wheel. The FUN offers maximum active and passive projection with ESP as standard and a full set of airbags: front airbag, sidebag and window bag. The last, in particular, guarantees maximum safety also to rear seat passengers due to its specific configuration. The entire 2008 range offers new fabrics and materials that increase the impression of superior quality within the passenger compartment. On the Dynamic, Fun and Sport specifications, for example, the dashboard insert is designed to match the interior colours and stands out for its attractive carbon fibre effect. The instrument panel is also new and more opulent with chrome rings, with different features on the “ConfortLife” range with its black background and white graphics and the “SportLife” range with a great background and wide graphics. In the same way, the sporty versions offer a steering wheel trimmed with perforated leather with top stitching in addition to original seats with PVC electro-welded inserts that add great sportiness and freshness. On the outside, the Grande Punto MY 2008 is distinguished by the introduction of four new body colours (Idealist Blue, Vigorous Brown, Captivating Red and Confident Yellow) and new radiator grilles: the “ConfortLife” grilles increase the perception of elegance with a new brighter paint, extended also to the lower grille, while the “SportLife” grilles offer a more challenging image with a black lower grille. 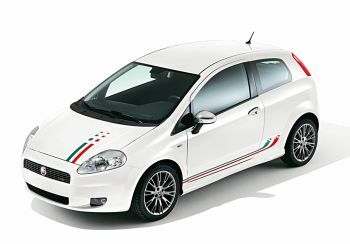 After the success of the stickers on the Fiat 500 model, the Grande Punto can also be personalised with numerous stickers of its own, priced from 150 euro to 170 euro. The product is available exclusively for the “SportLife” range and makes it possible to choose your favourite sticker to add a personal touch to your car on the basis of its body colour. Different interpretations of the concept of sportiness and dynamism are expressed in 3 versions: in more vintage spirit, with distinctive stripes of different widths (positioned lower down on the side panel); a lively design on the upper part of the side panel that ends with a motif somewhere between the layout of a mountain track and an art nouveau decoration - and lastly a classic tricolour band that starts on the bonnet and fades into an original chequered design. 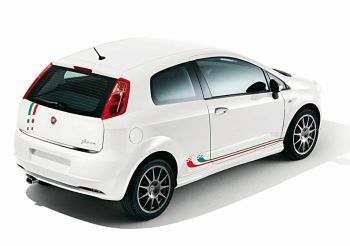 These three very appealing moods enhance the shape of the Grande Punto MY 08, making it unique. An option that younger customers will certainly enjoy, if the success of the Grande Punto Sticker Lab is anything to go by, is the digital workshop that has involved 8000 fans designing their own suggestions for personalising the outside of the car in just over one month. The 900 contributions received on the www.stickerlab.fiatpunto.it site were so original and interesting that the Fiat Group Automobiles Style centre awarded prizes not only to the 3 best ideas – as the rules demanded – but also to the other finalists and gave Special Mentions to 8 others.